There are the great things that our customers have had to say about The Aqua Group. 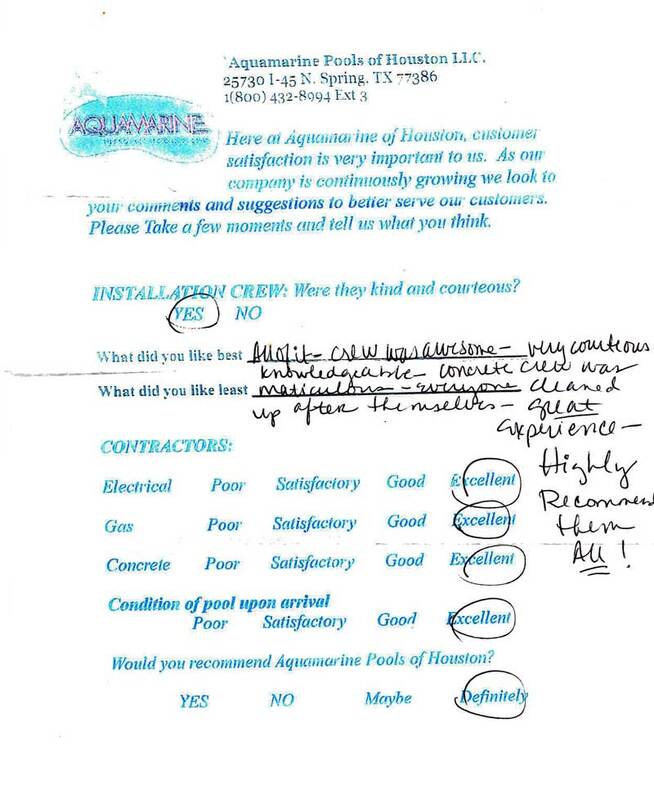 "We cannot say enough good things about Aquamarine of Houston. They are first class all the way! From conception to the finished project, everyone that we worked with was knowledgeable, accommodating, and friendly. There was constant communication, and always a ready willingness to address any, and all questions or concerns. We had many! Our outdoor project consisted of a number of elements, so we worked with three contractors to pull it all together. Aqua Pools was wonderful in working with and talking to the other companies on our behalf. Because of their extra efforts and open lines of communication, everything went off without a hitch. Our journey with Aqua Pools began with Brad – VP and salesman extraordinaire! We instantly liked him, and he took good care of us every step of the way. From helping us choose the right pool and placement, to insight on cleaners, equipment, etc. We have no doubt he helped us ward off some future headaches. On the day of installation, we met Steve, the Superintendent, as well as Chris and Scotty and their crews. These gentlemen brought the project to life and made sure everything was up and running. In a matter of days, we had a pool! Everyone worked in sync and you could tell they took pride in their work. And to this day, if we have a question, they take our call. That is customer service at its best! 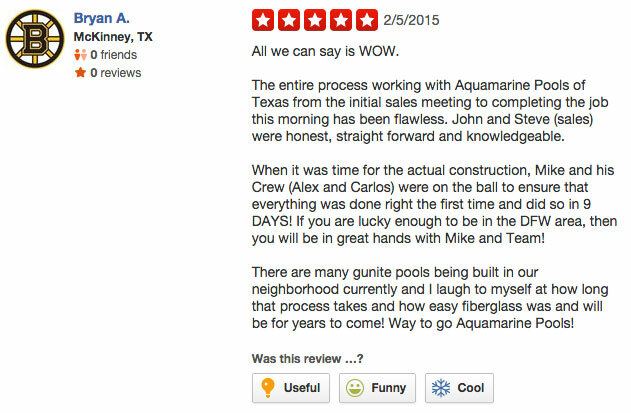 Would we recommend Aquamarine Pools of Houston – YOU BET – without reservation! And we have a beautiful pool to show for it – thanks guys! "Just wanted to thank Mike Wagner and his crew for an outstanding job installing our new pool. Too many times only the problems are noted, and we just did not want a great job to go unnoticed. The entire crew were so polite and willing to answer all our questions. They did a great job of cleaning up after the project was complete. Mike and his crew are a valuable asset to Aqua Pools. Thanks again! " What did you like best? - "All of it"
Q: What did you like best? 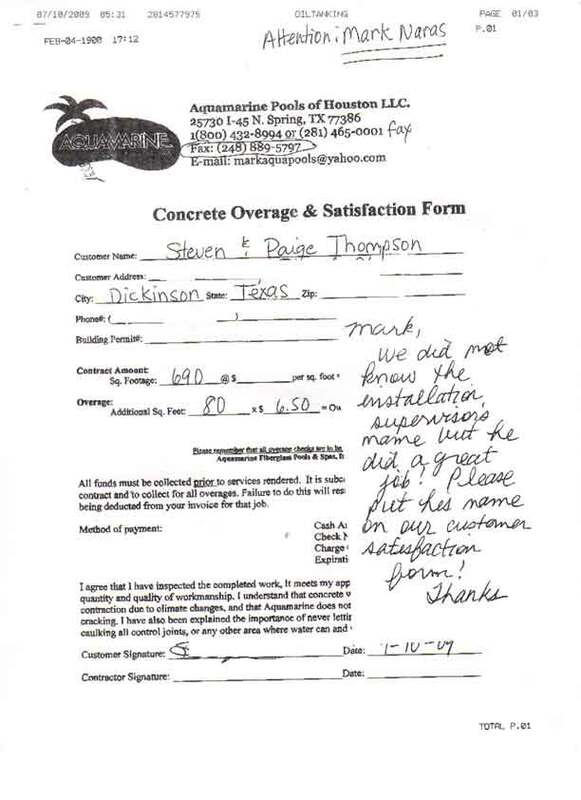 - "All of it - crew was awesome - very courteous knowledgeable - concrete crew was maticulous - Everyone cleaned up after themselves - GREAT experience." wanted to reach out and let you know what a great asset you have in Steve. His support was outstanding. The installation of our Laguna went very smooth but what really stood out was his support afterwards. When our temporary irrigation was overwhelmed by a major downpour resulting in the pool turning into the Mississippi he came by and help install a filter bypass that allowed me to vac the pool without having to clean the filter every 10 minutes. It was a huge benefit to getting the pool back into shape. Mike & your crew have been AWESOME! "I just want you to know Mike & your crew have been AWESOME! They have worked so hard in the past 24 hrs. We are very impressed! I've posted on our Grayhawk Facebook about y'all and have gotten tons of feedback wanting your info. I've given them all your number so hopefully you'll be putting more pools in our community. Tons of our neighbors were over last night and just couldn't belive how fast the process is." These guys have worked their tails off today! "I tell you, these guys have worked their tails off today! Have not taken a break or left all day. Highly recommend Aqua Pools. If anyone is interested in a pool, please give them my name so they'll know I sent ya. Also shoot me a message and I'll make sure they take care of you! Hands down BEST prices in the DFW area, belive me we researched it. :)"
Great people to work with..
"Great people to work with, from Jennifer and John, the sales team, to Jose and the other installers. They have great ideas and have great people working for them All very hard workers, with someone constantly on the move preparing. They are quick to answer any questions or requests you may have. I am someone who doesn't know a lot about pools, and I am so grateful we have Aquamarine Pools installing ours. If I could give more stars I would." Thanks so much! We are super excited!! I only wish Don had been our original sales guy... we'd be swimming by now! Thanks for sending him to us now. We are anxious to get our pool installed! So, whatever you can do to get us in the schedule ASAP is greatly appreciated! I will definitely be referring your company and brag on your crews. "I just want to let you know that we have really appreciated the professionalism and great job your crews have done for us. The concrete was finally poured today. I know Roberto was in the hospital which did cause a little hiccup, but all is well. Robbie has been awesome. He said he would try to have someone come out in the morning to go over the "pool school". And to help finish getting the pool cleaned/vacuumed etc so we can enjoy it tomorrow afternoon/evening after I get off work. It is absolutely amazing how fast this did happen. So glad we did fiberglass. Robbie did mention that the heater still needs to be hooked up. He said he could do it. I was under the understanding hookup was part of purchasing the heater and hookup was included in the price. I wouldn't purchase a heater without wanting it hooked up to the gas line :) . Can you see if Robbie can do this for us and give him an okay? Will try to find a way to send you some pics once it is cleaned up so you can use if needed for marketing, etc. "I just wanted to let you know that we are very happy with our AquaPools Viking pool we purchased almost one year ago. My wife Sheryl, daughter Hailey and I have had many wonderful hours of fun, joy and relaxation in our pool. The fiberglass, Bermuda, pool we purchased is very easy to take care of and very low maintenance. The installation of the pool and service provided after installation was exceptional and professional. You installation team went the extra mile on the pool installation and any issues that cropped up. I recently had a pool party and recommended aqua pools to several guests as they were interested in where we purchased our pool from. Thanks to you and Bobby for the hard work. Sorry I took so conveying this sentiment to you, but on the one year anniversary of our pool installation, I wanted to let you know that you guys our tops in pool sales, service and installation in my book." "You guys are a class act. I really appreciate you, sir. Thanks for always taking great care of me!" "I couldn't imagine myself picking another company over Aquamarine. " "Yall are doing great! Keep up the good work! " "I want to recommend Aquamarine Pools of Texas. John was super and listened to what I wanted and it is to perfection. The team was awesome and so professional and I am beyond happy with everything..and its outcome. The pool is just beautiful!!! I could not be happier and absolutely recommend this company to the highest. "No problem...again...your crew is awesome!! They have been so nice and beyond professional!! If you have a site where I can give my comments, I would be MORE than happy to do it. And if I know anyone that wants a pool, I will surely point them in your direction. I will give a check to your crew on Tuesday when the the concrete is to be poured. Y'all have gone beyond making me so excited with the outcome. Again, thank you for everything and the pool looks awesome and I couldn't be happier. Doug and all of our family can't wait to enjoy it." "How quickly and efficiently your crew got the pool in." Your Workers Are Doing a Fine Job! "Thank you so much. I really want to thank you. You guys have done a fabulous job. Very professional. Beautiful work. Your crew was so polite. Do you have a social media network page i.e. Twitter/Facebook. I'd love to brag about you." "... Mike came by Friday nite around 7:30-8:00 to show us how to use the vacuum, how to clean filter, skimmer, strainer baskets, and much more. He had been unable to do it upon completion of the pool because of delays in delivery of the pool and the concrete. I just wanted you to know that he deserves an attaboy for going the extra distance to come back and do that after a full day of work on another installation – plus a long drive to our house. Mike is a very conscientious worker and greatly enhances the reputation of your company. " "Hi John, I just wanted to let you know.....your workers are doing a fine job! They have been working really hard and long hours. It's really looking good so far. " "Just a quick email to let you know that we LOVE the Jamaica model Viking pool you installed for us last September/October and have no issues at all with it. It is easy to clean, take care of, and enjoy. Just wanted to let you know that we are very pleased with it and to again thank you and Mike, who installed it, for a great product!" "I want to thank you for the wonderful job you did in my house. The pool is beautiful. Please confirm me that my pool is protected with the cover we agree in our contract and please give me the bank account number in which I can send your son the monthly payment for the mantenience of the pool. Thank you very much." Overall, what did you like best? "The amount of time to install. Never thought it would only take 2 days." "The hand rail and backwash hose arrived yesterday, thank you. The hose will be very helpful! We are very pleased with the pool, and the great work of your crew (and especially the fact you were able to get it installed before our twin grand kids come. "They were wonderful. They let me know exactly what they were doing and were there on time everyday.Very friendly...."
"The final grading on my pool was finished yesterday and everything looks great. Everyone on the crew went above and beyond to make sure everything was done to my satisfaction. Please give my compliments to Bobby and his crew. 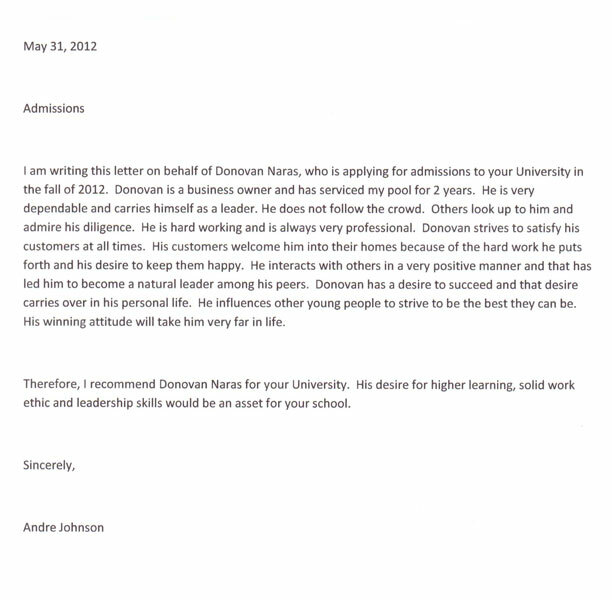 If you ever need a customer reference or testimonial, I would be glad to do it (I am sure you already have plenty). I decided I did not want the ladder, anchors, or escutcheons that were included, so I sent them back with Ralph yesterday. I also did not receive the Eco Saver cover or start up chemicals (I went with a salt chlorinator so the chlorine was not used). I do not want these, so please deduct these items from my account balance and send me an updated invoice." 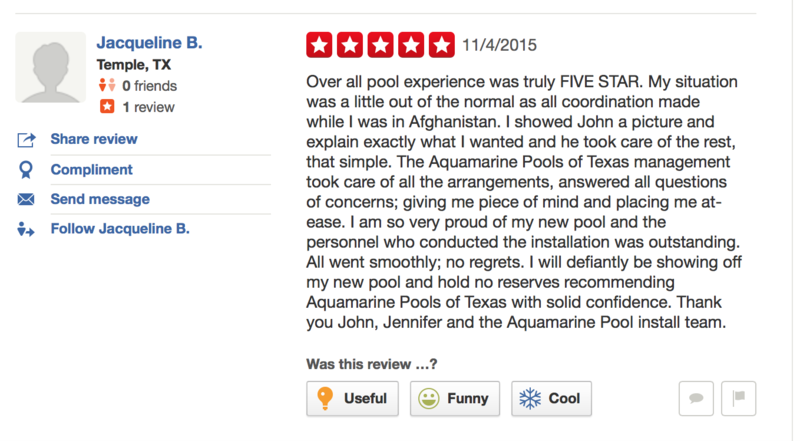 "Your pool people are very nice and eager to please." "has furnished all goods, services, and work.."
What would you suggest to help us improve service and installation? "Very friendly crew. Great job!" "Mike, Juan, Carlos and Jose did an amazing job and were wonderful to work with. They take pride in their work and go all-out to please. This was a great experience for us and love the finished product. We have a few things to do before 'final' inspection (safety latches) and Mike said we have a little time to install them, so I'll let you know when we're ready for that inspection. Thank you so much for making this an awesome experience!" Bobby and his son were professional and worked with us! Click the image to the right to read the full customer review! 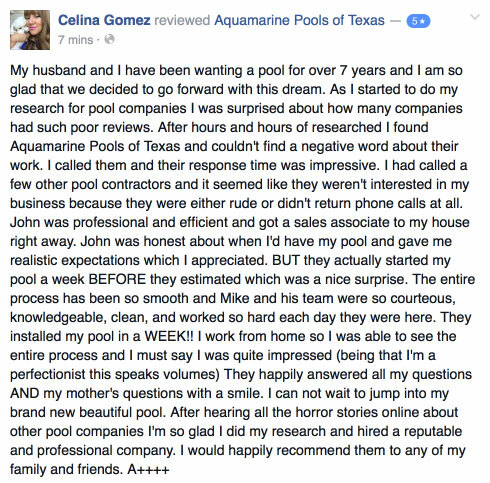 "We cannot say enough good things about John Mehrman and Aquamarine Pools of Texas. John was so patient with us and answered every question we asked, from the start of the job until completion. And what a beautiful pool he built for us! The quality of work is outstanding. We gladly give a five star review and would highly recommend this company to anyone looking to get top quality at a reasonable price." .. He is hard working and always very professional. The guys were very helpful wih instructions.
" We have had the best experience with John since day one! Other companies acted like they didn t want our business, but not Auquamarine! The installation team was always prompt, courteous, and kept us informed every step of the way. John came out several times during and after the install. Not only did we get pool school from the installer, but John came out to make sure we understood and walked us through everything a second time to ensure any questions were answered! Every time we have contacted John since our install (Oct 2011) we have gotten rapid responses! Thanks To John and the Auquamarine team for making this a seamless and pleasurable experience! We highly recommend them! " 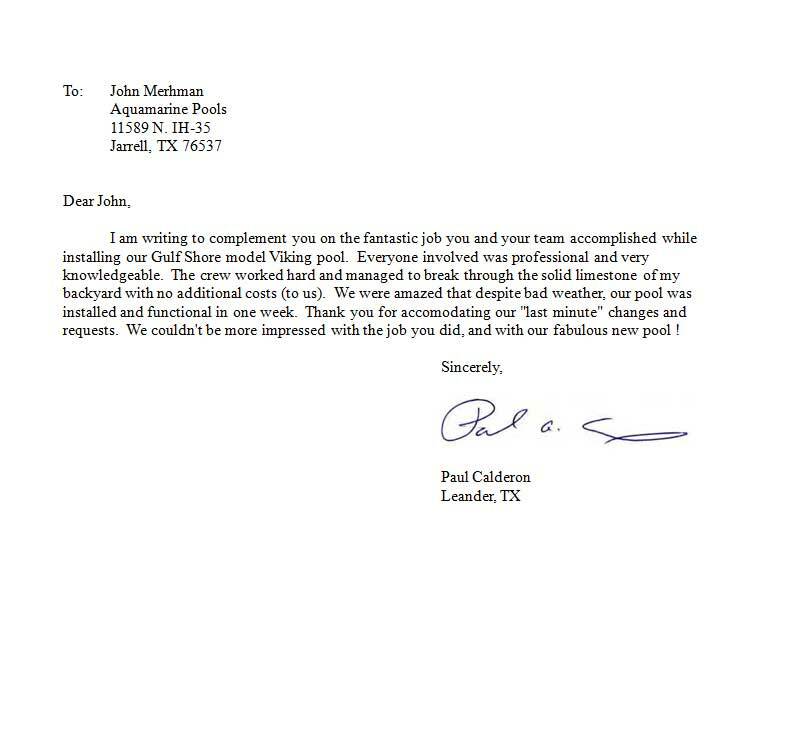 "I am writing to complement you on the fantastic job you and your team accomplished while installing our Gulf Shore model Viking pool. Everyone involved was professional and very knowledgeable..."
"I hope you are doing well! I bet you are very busy! I need to make you aware of two things. First of all, we had our sprinkler system inspected today. The service man said that you guys did an AWESOME job moving and reconnecting the sprinklers. He estimated that the work perfomed by your team saved us between $1400 and $1600 dollars, had we had an irrigation company come out and perform the work! Please pass a thank you along to your team! The other thing is that our remote is not working with the lights. We noticed it after the last storm. We can turn them on manually, and the red light on the remote flashes when we press it, but nothing happens. Please advise. Thanks again and WE LOVE our pool! " "I just read your article 'Six deadly pool purchasing mistakes' wow, great information. In one place, I learned everything I need to know about what type of pool would best fit my needs. I have been researching for months and piecemealed the information. 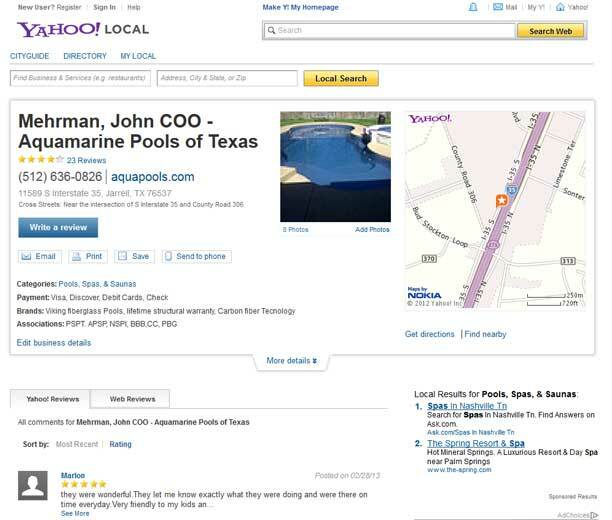 I am so excited to have the knowledge I need to begin talking to pool developers." "Thank you and your crew for all of your hard work. It is greatly appreciated." ".. hard workers, on time, very polite." "The crew was awesome to work with." "Hi John, just wanted to write you a note to tell you how pleased we are with our new pool. Aquamarine Pools of Texas was the best choice we could have made. You told us you would have the pool ready to swim in 3 days and in 3 days we were swimming! The crew you had doing the work were professional, hard working men. We are truly happy with our pool and would recommend one to anybody. 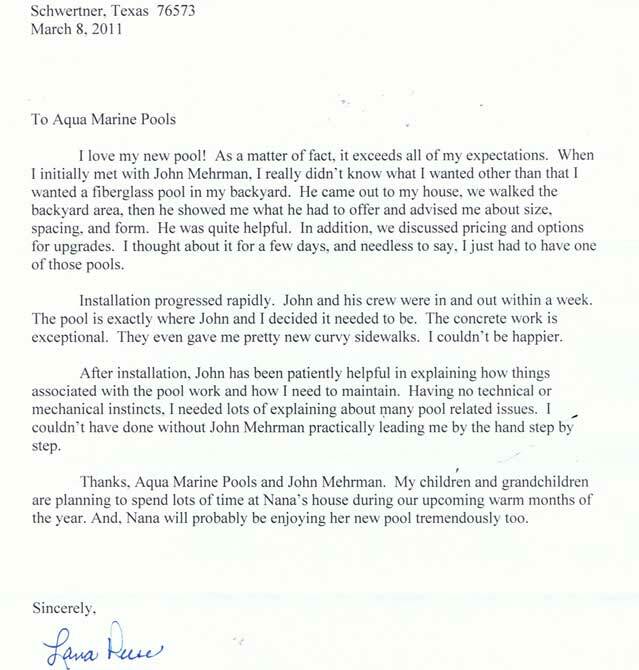 Thanks again, "
"We are so glad we chose you to purchase our pools. We are extremely happy!" "Everything has finally come together in a short period of time and we have the oasis we have dreamt about." What did you like most? "Mark and THE POOL!" 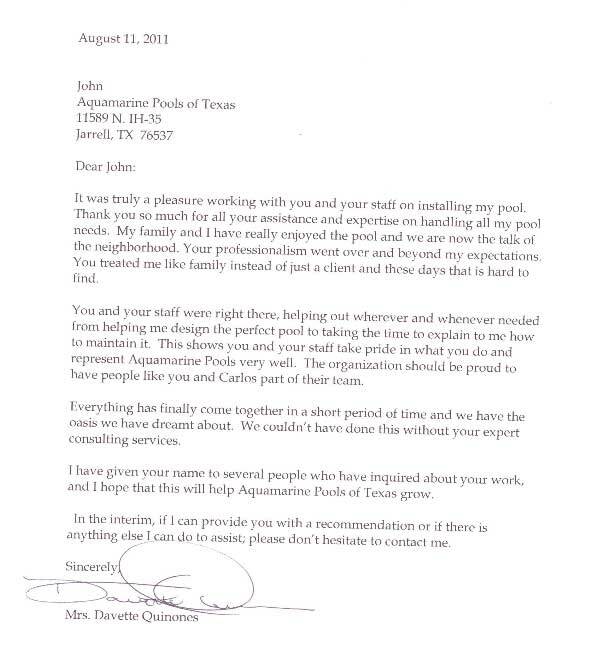 "Kellye and I would like to thank you for the wonderful job Aqua Pools did for us. In the beginning we were not sure if we wanted a traditional gunite pool or give the fiberglass pools a try. You were very kind in answering all of our questions and advising us every step along the way. Our pool is beautiful and we are very happy with the finished product. I was amazed at how fast the installation was, and everyone was so professional and informative. Since this was our first pool; what I appreciate the most is, you have been there for all of my questions during my "learning process" AFTER the pool was installed. You do a terrific job my friend!" "Timely and helpful. Easy to contact." "I love my new pool!" "..our backyard is the oasis we had hoped it would become." "Straight forward and candid - extremely knowledgeable!" "Everything went very smoothly. I am thrilled with my new pool!!!" 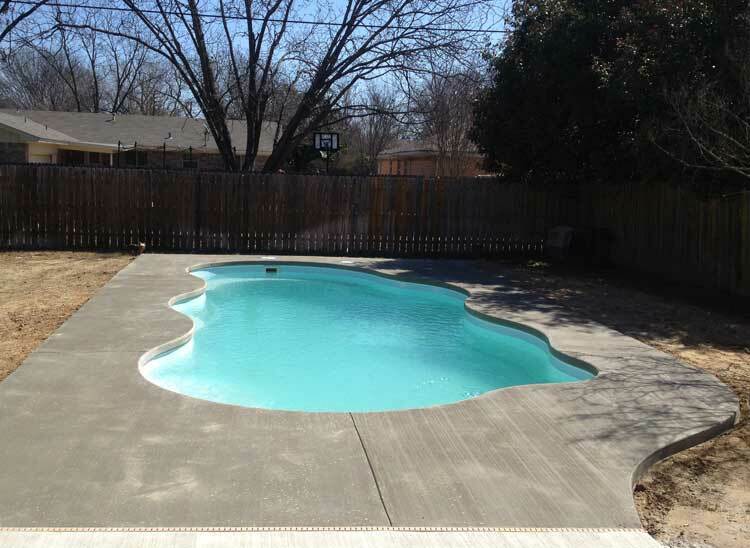 "I would recommend this type of pool and pool company to anyone looking to put in a in ground pool." "The crew was always polite and worked very hard." "They do a great job!" "We did not know the installation supervisor's name but he did a great job!" 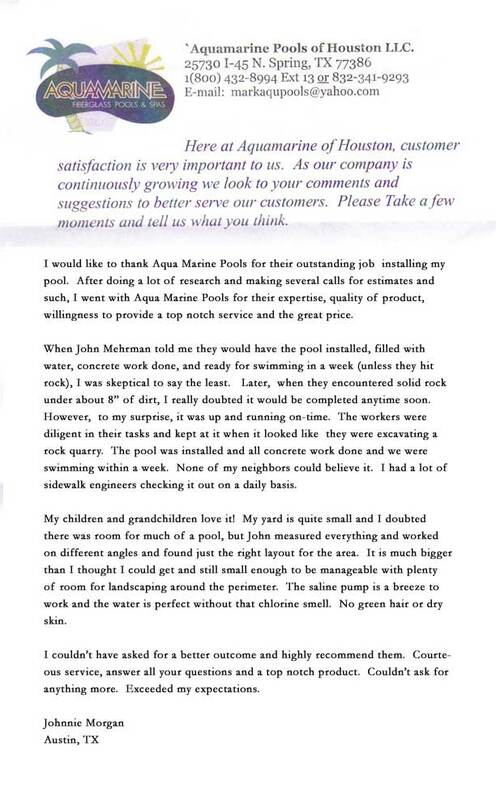 "This is to advise you of our satisfaction with our new Laguna Deluxe pool. The Viking product is clearly top of the line, and the installation proceeded on schedule with the expected results." Excellent ratings across the board!!! "Bill and I just wanted to say thanks for making our pool installation go as smoothly as possible. Everyone associated with the installation was great to work with." "We are very pleased with everything from the very first day till the end. We were very happy with the finished job." Just a quick note to say 'thank you!' All of you have been truly wonderful during this pool installation process. You have truly helped me out and were good to your word that I could handle this without my husband being in town. All of your contractors have been just as helpful and great to work with. Thank you all again for your wonderful customer service..."
I am writing this letter as a recommendation for John Merhman. 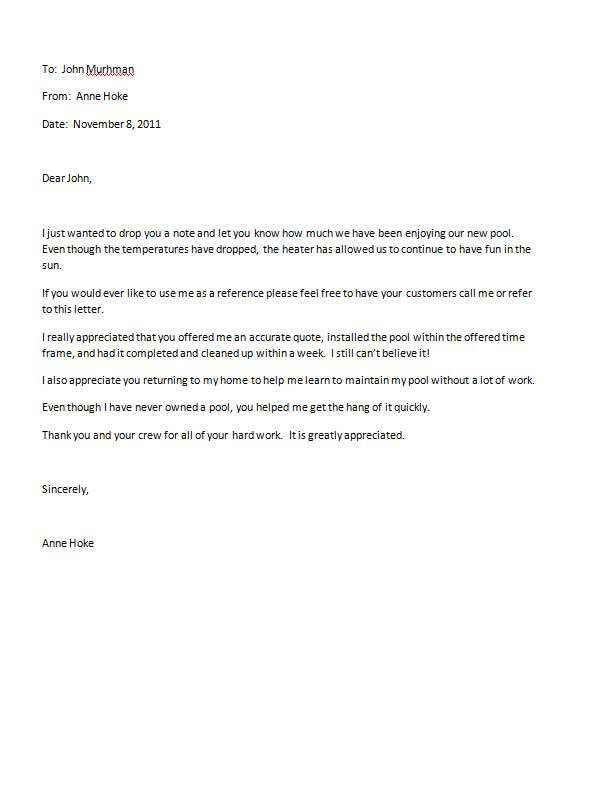 John was our salesman and project manager for a swimming pool that we installed this summer. My husband and I were really nervous about the process and had heard many terrible stories from friends about their experiences when doing projects like this. We are happy that we chose this company and had the pleasure of working with John. He was very friendly, professional and excellent at communicating with us every step of the way. He helped guide us through the pool selection process, the best place to lay it out, and how we should design the area around the pool. In addition, he mapped out the project for us and kept us informed of what was going to happen next and when. What was so refreshing was that practically every date given to us was met. If I ever needed to call John with a question, he was always quick to respond. If he didn't know the answer, he would research and get right back to me. I could not have asked for a better experience. John made us feel like he understood that we were excited about getting our new pool and truly wanted to make the process as quick and painless as possible. I have made a point to tell people about the great experience we had working with this company and how wonderful John was. I truly believe that having people like this in your company will bring great success to it. 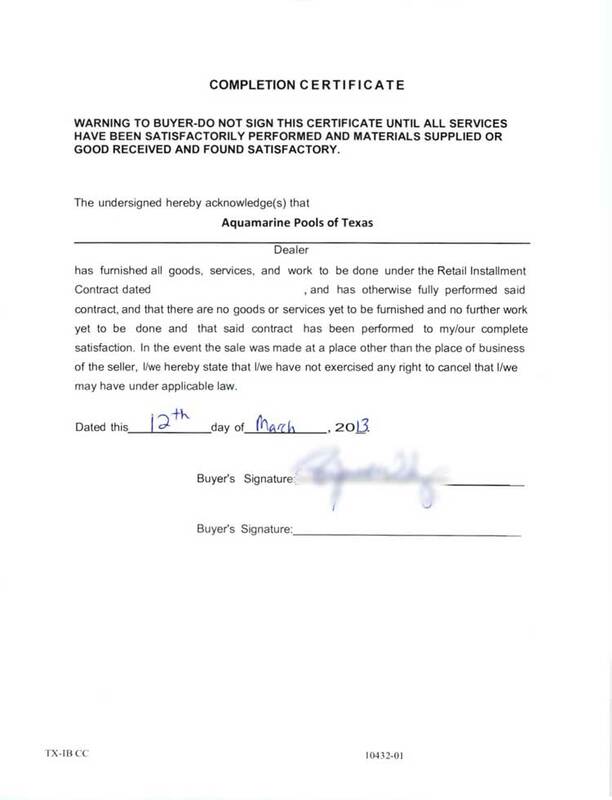 "We purchased a fiberglass pool from Aquamarine Pools of Texas. The sales people were extremely helpful and knowledgeable about their products. We purchase a Viking Gulf Shore that was on site. It was dug, delivered and filled in four days... The installers were efficient and polite. 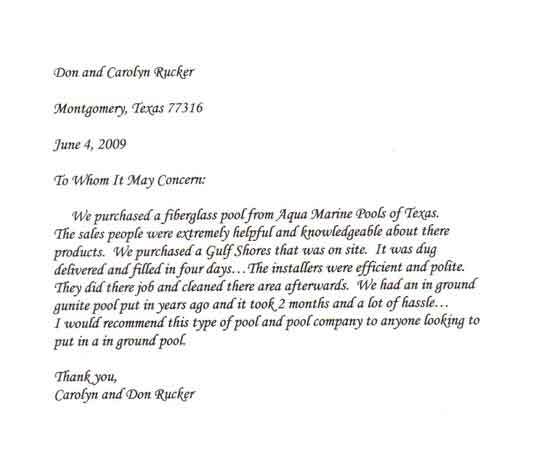 They did their job and cleaned the area afterwards.We had an inground gunite pool put in years ago and it took 2 months and a lot of hassle... I would recommend this type of pool and pool company to anyone looking to put in an inground pool. "The install team was very professional and hard working. The foreman had it all under control. They were all team players and knew their job. They were on top of it from the start to the finish. Job well done." "The installation supervisor did an excellent job and explained all the stages of installing. He was thorough on explaining how to run the pump, vacuum and answered our questions. Very pleasant to work with an very patient." "Very hard working & excellent work. I would recommend them to anyone." "Thank you for assisting us with our long awaited pool purchase. As you remember, my husband had just left for Iraq last year when I first asked you to come out and give me a quote for a new pool. He was gone a full year when he returned in June 2009. Shortly after his return, he was wanting to reward his family with something special because he had been gone so long and missed out on many family events and activities. One day in July, he said, "I think it is time for that new pool." I was so excited I could hardly contain myself. I believe I called you the very next day to get a new quote and talk with my husband. Our twin boys (9), and daughter (11), were even more excited. You helped us pick out a design and layout and our pool order was placed. About 3 1/2 weeks after the pool was ordered, it was in the ground and we were swimming! I was amazed at the speed at which it was all put together. When I told my co-workers that we were already swimming in our new pool, they could hardly believe it. The men who worked so hard in the 105+ degree temperatures to get the job done, really deserve a huge pat on the back. They worked every day, including Saturday in the sweltering heat where not one single day was below 100 degrees. They were well-organized and everything went like clock-work. The electrician came and went, and got his part done in the morning so I never saw him. When I came home, though, I saw the work he did and was impressed by the neatness and concealment of the wires under the eave of the house. There was even a place he dug underground to extend from the pool to the house and we were unable to tell he even dug there. He must have cut a skinny trench and fit the grass patches back in place as if putting together a puzzle. We truly could not see the cut marks at all. The cement work was exactly the way we wanted it. We were worried because it was impossible for us to be home the day the cement was poured and we thought something would get missed. I know I called you several times to give you specific instructions about how we wanted the cement because my husband was very particular about details. When we saw the finished work, we were amazed that ALL of the things we wanted done, were done just right. I am sure you know what it is like to be disappointed by the promises a companies can make, then, have one company get the job right the first time was just an extra surprise. Whenever I had a question, I called you. If you were unavailable, you called back immediately and had the answers I needed. We have had our pool over 2 months now, and I know that if I called you today, tomorrow, next week or next year, you would be there to help with any of our pool needs. We live out in the country and there are no activities for kids here. Our pool was just the thing we needed to enjoy our land and enhance our landscape. So, I thank my husband for his outstanding service to our country and working so hard in Iraq, and I thank you for your outstanding service to our family. We would have not enjoyed this summer heat without our beautiful, new pool."